Talented florists, including a number of our special 5 British Flowers Week florists, have created exclusive bouquets, designed with only this week in mind. These designs will be available for a limited period of time, so we encourage you to snap them up quickly if they catch your fancy – and how could they not?! This bouquet is created by Zita Elze, owner of Zita Elze Flowers in London’s leafy Kew, and one of the featured florists of British Flowers Week 2015. The very essence of a British summer meadow, this beautiful hand-tie contains ox-eye daisies, grasses, ammi, nigella, craspedia, poppy-heads, dried scabious seed pods and camomile. Medium (as pictured) - Price £80.00 plus delivery. Other sizes are available upon request. A romantic, grassland bouquet of deep purple cornflower, scabious seed pods and grasses. Medium (as pictured) - Price £85.00 plus delivery. Other sizes are available upon request. This bouquet is created by Mark Welford and Stephen Wicks, owners of Bloomsbury Flowers in London’s Covent Garden, and one of the featured florists of British Flowers Week 2015. This glorious bouquet zings with the scents and colours of summer from the deep burgundy of the scented sweet peas to the soft mauves of the alliums, salvia and the vibrant lime green of alchemilla mollis. Delivery within the M25 only. This stunning hand-tie is by Hattie Fox, owner of That Flower Shop in London’s fashionable East End, and one of the featured florists of British Flowers Week 2015. Hattie's design is wild and loose and overflowing with locally-grown nepeta, delphinium, astrantia, ox-eye daisies, foxgloves, stocks, peonies offset by green hornbeam, cotoneaster, eucalyptus and the yellow pop of euonymous and golden privet. Available for next-day delivery nationwide. To order call 0203 302 5496 or email info@thatflowershop.co.uk. To celebrate British Flower Week, the Real Flower Company has designed a unique heavenly scented bouquet incorporating the best of the summer growing season and most specifically delightfully scented, pastel coloured garden roses including Margaret Merrill, Romantic Antike, Pink Princess, Chandos Beauty and Evelyn. Creatively hand tied with English grown wildflowers and aromatic herbs and foliage* each bouquet will have an additional 25% of extra scented roses incorporated. What a perfect start to the summer season celebrating all that is lovingly nurtured and grown here in the UK. English grown Sweet Williams make a perfect choice for a summer posy. With its cleverly colour coordinated flowers in white, pastel pink, lilac and mauve, our McQueens version is as pretty as a picture and has all the charm of an English country garden. To honor British Flowers Week, Moyses Stevens have launched the 'Daisy' hand-tie as our way to celebrate the wealth and sustainability of seasonal grown flowers and foliages here in Britain. Lovingly hand-tied, the 'Daisy' bouquet mixes dainty 'Daisies', prestigious 'Poppies', scented 'Stocks', scintillating 'Sweet Peas' and brilliantly blue 'Cornflowers' with a variety of verdant British grown foliages. Using an mix of seasonal and wonderfully fragrant flowers, this quintessentially British hand-tie is a superb choice as a gift for any joyful occasion. 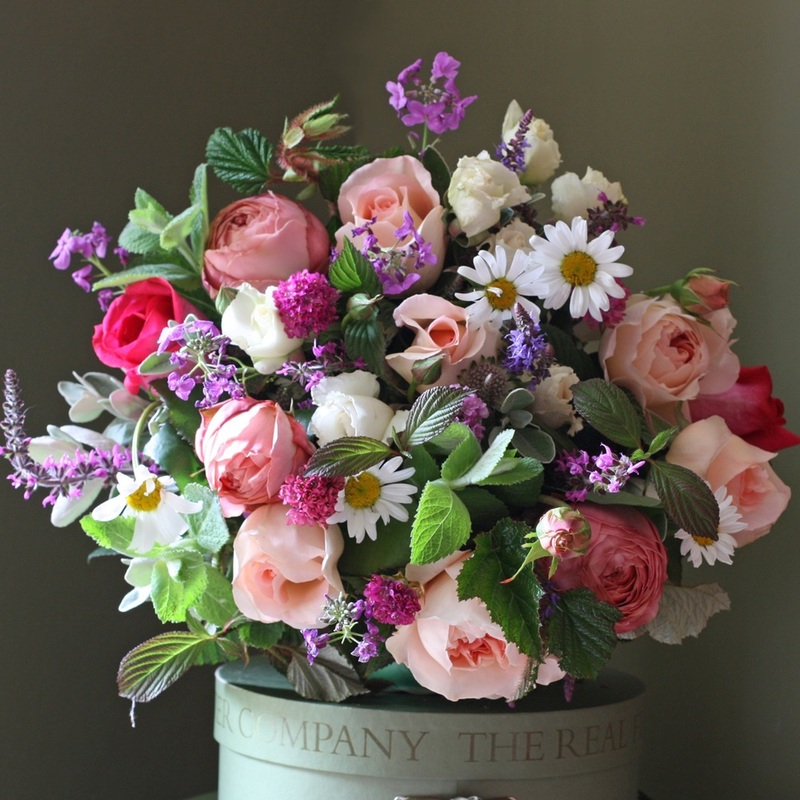 In celebration, Rockflower have created a beautiful simple bouquet inspired by the glorious British summertime. Think croquet on the lawn with a refreshing gin & tonic and a slice of lime, cool cucumber water after a great game of tennis or cricket in your whites. That’s where they got the green and white inspiration which was interpreted with stunning hydrangeas and foliage. Then, for a touch of soft colour, a tiara of pink roses is added, a classic in a British summer garden. The result is ‘British Summer’, wild and just like an English garden in full bloom. Available 24/7 from Rockflower at Blackfriars Station. Sussex Roses, growers and florists based in West Chiltington, West Sussex, are producing stunning British Flowers Week bouquets with a natural summery feel. They will be sticking to the theme of red, white and blue flowers to signify the celebration of British flowers and the week itself. Jam jar posies, like the one pictured on the left, start from £7. Hand ties, like the one pictured on the right, start from £15. Sussex Roses offer free local delivery on orders over £15. Orders for British Flowers Week jam jar posies can be made by emailing sales@sussexroses.co.uk or phoning 01798 813965. First 4 Flowers in Sheffield, an all year round British grown flowers supporter, are offering a gorgeous 100% British hand tied bouquet for all of British Flowers Week. It's available to buy online from £25, £35, £45 and £55 for local delivery around Sheffield, Rotherham, Worksop and Chesterfield areas. Vanessa Birley Florals are offering this gorgeous special edition British Flowers Week bouquet, available for delivery in South West London from their chic floral design studio. Larger bouquets available on request. Church Lane Flowers are celebrating British Flowers with an abundance of British blooms plus special bunches of locally grown, organic flowers. These delightful little "tussie mussies" include Sweet Williams, Sweet Peas, dill and sage. All this freshly-picked loveliness is yours for only £4.50 a bunch but they have a limited supply so don't miss out! Call Church Lane Flowers on 01323 897564 to reserve your bunch or to order a beautiful bouquet of British gorgeousness to collect or have delivered. Inspired by these amazing designs? Then why not speak to your local florist about putting together a British bouquet for you? You can find a list of just some of the hard-working florists supporting British Flowers Week here.